This is my Mom’s Pork Loin. I grew up in an incredibly food-rich household. We sat down to dinner as a family every single night after my dad got home from work. We said grace (because of or despite being Unitarians, not really sure). And every single night, my mom made a fully balanced, completely delicious and nutritious meal, composed of vegetables, a starch and some protein. I never ate it. If you’ve been following along, you know I was a picky, word-class, non-eater. I’d devour the starch (usually pasta, as I maintain an aversion to rice for whatever weird reason, even to this day), pick at the veggies, and that was that. Did I mention my mom is a trained chef? I’m sorry, Mom. You were right. Food is awesome. Especially yours. First, get all your veggies prepped. If you time it right, you can have both of these dishes coming out of the oven around the same time. Peel and chop your garlic, cut the broccoli, wash and (important!) dry the florets thoroughly. Preheat the oven to 400 degrees. In a pan that can go from oven to stovetop, rub the pork loin all over with Dijon mustard, sprinkle tarragon, a bit of salt (not too much! there’s salt in the mustard) and a good amount of pepper over the loin. 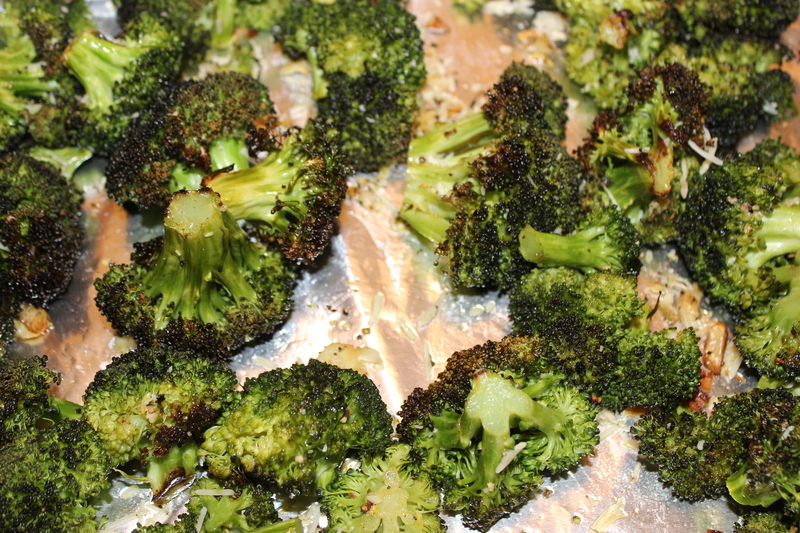 Spread your broccoli on a separate baking sheet. Drizzle with olive oil, salt, pepper and the garlic. Give it a good toss – don’t be afraid to use your hands. Put both the broccoli and the loin in the oven for 20-25 minutes. 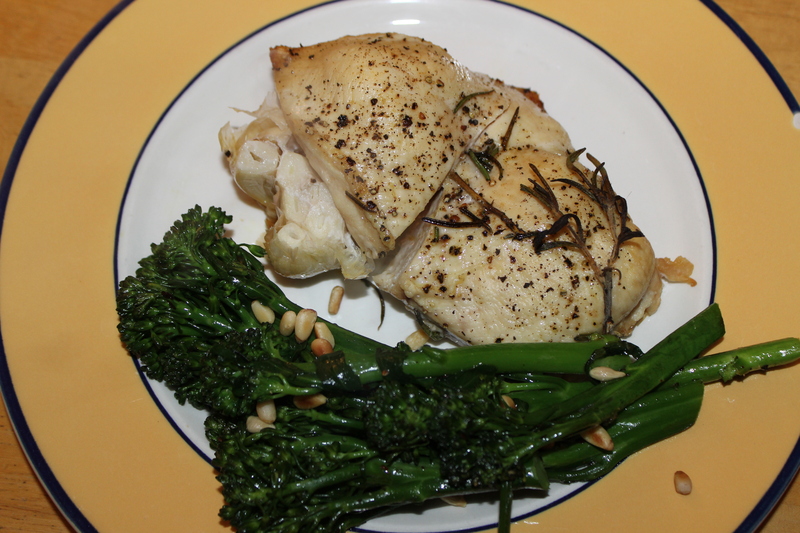 Take out the broccoli when it starts to brown at the edges; take out the loin when just slightly pink in the center. Take the pork out of the dish and let it rest (don’t cut into it just yet). In the same pan it cooked in, add wine and sour cream, bring to a boil on the stove and reduce. Be careful not to let the sour cream burn. Toss the broccoli with lemon zest and Parmesan cheese. Add a few squeezes of lemon juice, some basil and pine nuts if you please. Slice the loin, serve with the sauce and veggies. Think about how fast, easy, and tasty your dinner is! This was fast, easy, healthy, and tasty. What more could you ask for? 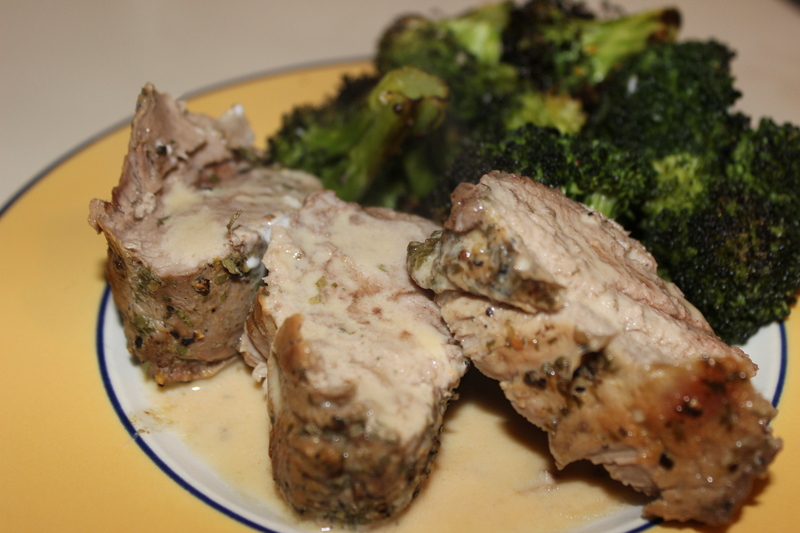 Posted on December 13, 2014 December 14, 2014 Author varinajCategories pork, vegetable sidesTags broccoli, garlic, ina garten, mustard3 Comments on This is my Mom’s Pork Loin. While, as I’m sure you’ve noticed, weeknight meals tend to be quick or one-pot affairs, the weekend allows me a bit more time. Enter our girl Ina. As my sister talked about a couple weeks ago, there is a serious love for Ina in our households, that began with my mom and trickled down to both of us. With a little more time on my hands to cook, I chose this particular recipe as part of my ongoing bid to get the Husband to enjoy fish (um, it has prosciutto!). Because if Ina can’t get the husband to tolerate it, who can? Preheat the oven to 400 degrees. On a jelly roll pan, toss the diced vegetables (except for the garlic) together and drizzle with olive oil, salt and pepper. Ensure everything is nice and coated; spread out in a single layer and roast for 30 minutes. While vegetables roast, line another sheet put with aluminum foil and place a baking rack on top of the foil (I don’t have one of these, so I skipped this step.) Brush the fish fillets with olive oil and season with salt and pepper. Wrap the fish in prosciutto, all the way around. Roast in the oven for 10-15 minutes. Back to our roasting vegetables. After the 30 minutes or so, toss the garlic in with the rest of the vegetables, stir them around a bit, and roast for about 10 minutes more. While the vegetables and fish finish up, melt the butter over medium heat in a saute pan and add the rosemary sprigs. Cook over low heat until the rosemary is crisp and the butter browns a bit. Stir in some lemon juice and set aside. Depending on your oven, and whether you used skinless fillets or not, your fish will be done at about the 12 minute mark. Plate it with roasted vegetables and spoon the rosemary butter over the fish. Garnish with lemon wedges and serve immediately. crispy prosciutto, melted butter, delicious veggies…yum. The recipe clearly calls for skinless fillets, which I neglected to buy. I also have a strong suspicion the baking rack roasting method is designed to keep an even flow of heat around the fish, so that it cooks quickly without being overdone. That being said, the fish still turned out beautifully, if potentially slightly overdone. 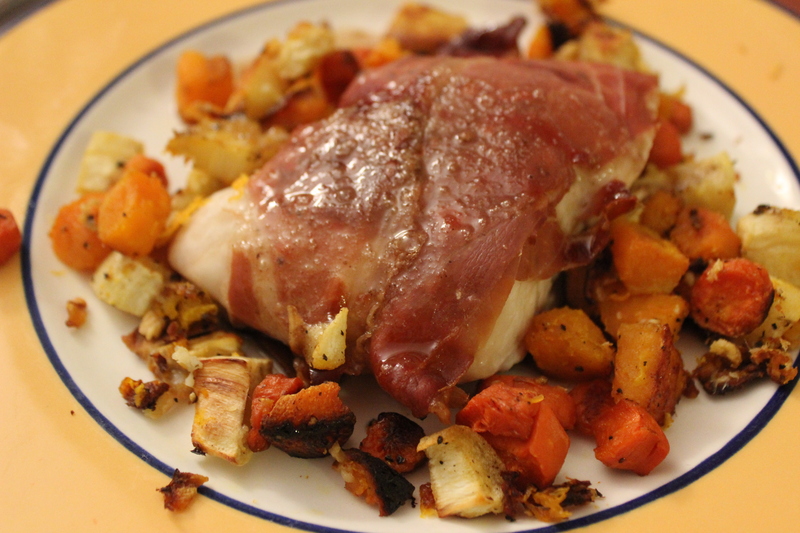 The prosciutto was crispy and added both a texture and a saltiness to the sweet, roasted vegetables. The best compliment was the Husband’s empty plate, and his pronouncement that he’d “definitely” eat this again. Also – I’m going on record now: parsnips are to 2015 the way kale was to 2014. I’m going to start a parsnip watch. Join me? This may just be the newlywed talking in me, but getting married was pretty much the best thing ever. Every time I think I’ve decided on the BEST part (like getting to spend my life with the Husband, for example), I remember another reason for which to be grateful. Like the incredible outpouring of love from the amazing circle of women in my life – my mom, sister, mom-in-law, sister-in-law, longtime family friends that feel more like family, and the new group of family friends into which I already feel adopted. At my bridal shower, I was presented with a book of (handwritten) recipes from all of these incredible women – from one of my mom’s best friend’s homemade chicken soup to my dad’s secret salad dressing to Mimi’s (that’s the Husband’s grandmother, and now mine, too) recipe for her own husband’s heart (as she also carefully notes – “date night? you have to be kidding!”) The following recipe is from my sister (more details on her coming soon…). We served them alongside a (store-bought) chicken pot pie (cleaning out that fridge in anticipation of another BEST part, our honeymoon!). 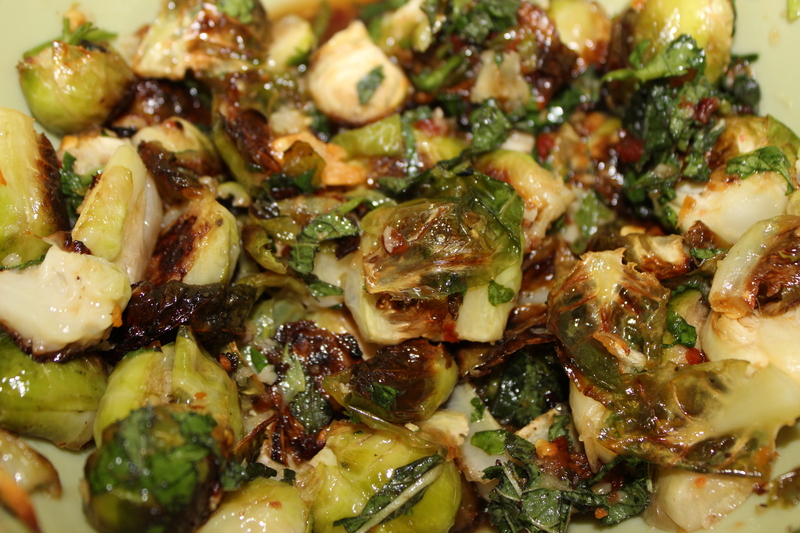 Toss the halved brussels sprouts in a bowl with the garlic and enough olive oil to lightly coat all the pieces. Mix it through and then spread out on a jelly roll pan. Bake until the outer leaves are crispy, about 25-35 minutes. If the sprouts are small or you minced the garlic, like I did, make sure to check in on these bad boys on the early side – roasted garlic is delish, burnt garlic, not so much. While the sprouts are roasting, make the dressing by combining all of the ingredients and whisking through until the sugar dissolves. Taste before serving – I added some fresh ground black pepper to balance out some of the saltiness. Toss the brussels sprouts with as much dressing as you like and serve immediately. salty, garlic-y vegetables – my favorite! These are delicious, though I’ll admit to tossing them with too much dressing, which made them a little “pungent” in the Husband’s words (to be fair, he’s also not a huge fan of fish sauce). Once tossed with the dressing, these don’t reheat all that well (heated up the next day, these were a little mushy), so drizzle accordingly. The combination of a little heat, salt, garlic and cilantro, though? Right up my alley. At book club this past Tuesday, my friend Kate made an amazing corn and roast tomato pie with a homemade olive oil and sesame crust. Turns out, that delicious crust was a Martha special…though the filling was all Kate! For my first go-round, I tried to follow the recipe, copied and pasted from Martha Stewart’s website, below. 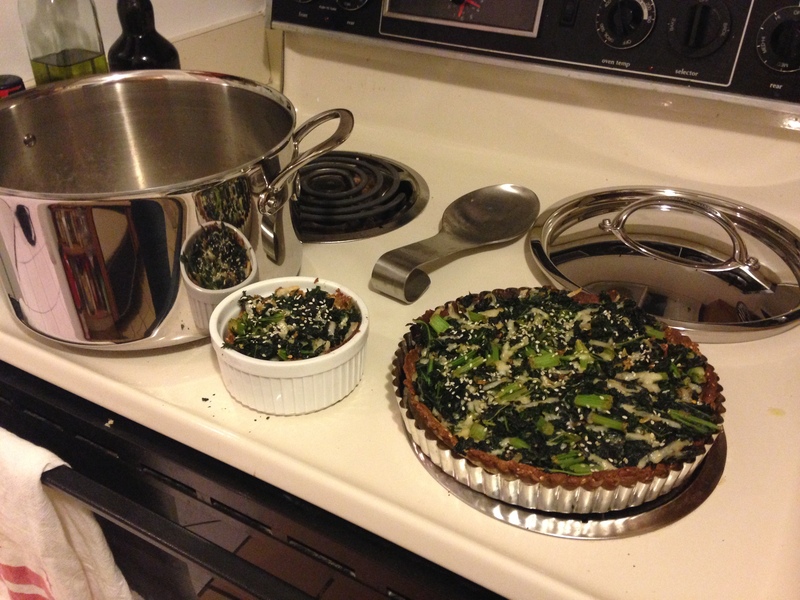 Of course, it wouldn’t be me if I didn’t make a few small tweaks…kale for the spinach, shredded gruyere for the feta, a bit more garlic and whole wheat flour. Crust: Preheat oven to 425 degrees. Whisk together flours, salt and sesame seeds in a large bowl. Stir in oil and water, then knead until a ball forms. Roll out dough (on a floured surface!) and fit it into a 9 1/2-inch tart pan with a removable bottom. Trim any excess length (I actually made a smaller version of this with extra dough in a small ramekin). Prick bottom all over with a fork and bake until crust is golden brown and crisp, about 30 minutes. Filling: Reduce oven temperature to 350 degrees. Place spinach/kale/greens in a large pot (if dry, add a little bit of water) and cover. Cook over medium heat, stirring occasionally, until just wilted. Transfer to a colander to drain. When cool enough to handle, wrap in a kitchen or paper towel and squeeze to remove excess water. Coarsely chop and transfer to a bowl. Wipe pot dry and heat oil over medium heat. Add shallot, garlic, and red-pepper flakes; cook, stirring, until shallot is softened, about 4 minutes. Transfer to bowl with spinach. Add cheese, eggs, and salt; stir until combined. Pour filling into crust and sprinkle with sesame seeds. Bake tart until just set, 30 to 35 minutes. Let cool slightly, about 10 minutes. This one is a toss up. I tasted Kate’s pie – and it was delicious. Mine, not so much. I burned the crust and the kale was slightly too bitter to be tasty. More cheese probably also wouldn’t hurt. Overall, well worth incorporating into the rotation (especially if I can get it to taste like Kate’s! ), though I’ll need a few more tries to perfect this bad boy. spinach pie and mini me. Posted on September 24, 2014 December 14, 2014 Author varinajCategories vegetarianTags garlic, gruyere, kale, martha stewart1 Comment on Channeling Martha.